“Mary Ann McSweeney reveals herself to be a talented bassist and bandleader, a resourceful composer and an imaginative arranger. The musicians on the album are outstanding. Opting for the unusual frontline of trombone and saxophone, McSweeney enlists Mike Fahn and Donny McCaslin respectively. Fahn plays both valve and slide trombones, and McCaslin switches between tenor and soprano, giving McSweeney additional colors to work with. Henry Hey, a budding master, provides wonderful orchestral viewpoints at the piano. Tim Horner, at the drums, serves as McSweeney’s partner in rhythm, and percussionist Joe Mowatt appears on three tracks. 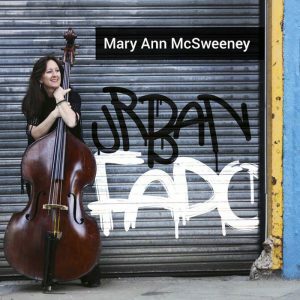 “If you haven’t heard of bassist Mary Ann McSweeney, you should. After years of work on both coasts with names like Dizzy Gillespie and the Diva Big Band, McSweeney has released a brilliantly conceived and executed album that she leads. “The fact that McSweeney leads Thoughts Of You is another reason for attention. Few bassists are leading their own groups, with the notable exceptions of, say, Dave Holland and Avishai Cohen, let alone securing recording opportunities for the groups with a nationally distributed label. “While McSweeney’s buoyant work on the bass and her melodic sound capture the imagination of the listener, the true value of Thoughts Of You is the excellence of the group’s work. Ever present, McSweeney sets the tone for the tunes, as did, for example, Mingus. Her arco introduction of “Stillness” quietly and ruminatively lays down the foundation of her composition, even before soprano saxophonist Donny McCaslin and valve trombonist (and McSweeney’s husband) Mike Fahn come in. From her quiet outlines of the piece, “Stillness” builds into a haunting performance not unlike Tadd Dameron’s “Fontainebleau” in its harmonic achievement. “And yet, McSweeney’s attitude on “R.B.’s Tribute” possesses an entirely different quality as she reminds listeners of the infectious swing of her earliest inspiration, Ray Brown. The loping bass lines, animating a modified blues, establish the tune’s mood, even as she breaks into a straight 4/4 walking bass line. Fahn follows the suggestion of swing, his valve trombone an important presence on this album.